Which do you prefer? 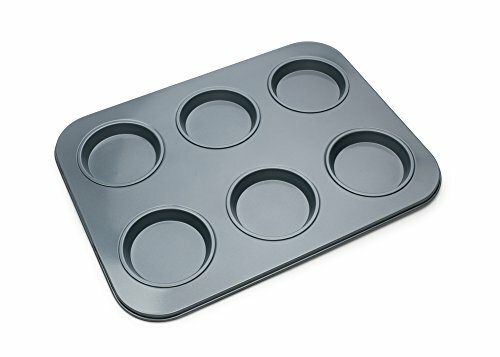 bakeware that disappoints or bakeware that performs? this large shallow muffin pan is part of the preferred non-stick bakeware collection, designed specifically for Fox Run. It features our exclusive premium non-stick coating, which provides quick and easy release of baked goods. This pan is made of heavy gauge carbon steel, allowing even heat distribution for exceptional baking that is backed by our 5-year warranty. Its 6 x 0.125 cup Capacity makes it perfect for making delicious muffin tops, homemade buns, eggs for breakfast sandwiches, and more. Bake the preferred way, with bakeware that performs. 5 year warranty fox run brands warrants that this bake ware will be free of defects for 5 years from date of purchase. If Product does not function as warranted, return to Fox Run brands, 1907 Stout Dr., ivy land, PA 18974, with original purchase receipt. A replacement or similar item of equal value will be returned to you. This warranty is void if Product is used commercially or is damaged by negligence or misuse. Scratches or discoloration may occur from normal use and is not subject to warranty protection.